Wisconsin Budget Battle Draws National Attention : It's All Politics Wisconsin teachers and other union members protest plans to cut worker rights and take home pay. Demonstrators jam Wisconsin's state capitol to protest a Republican bill to reduce public worker bargaining rights and take home pay. 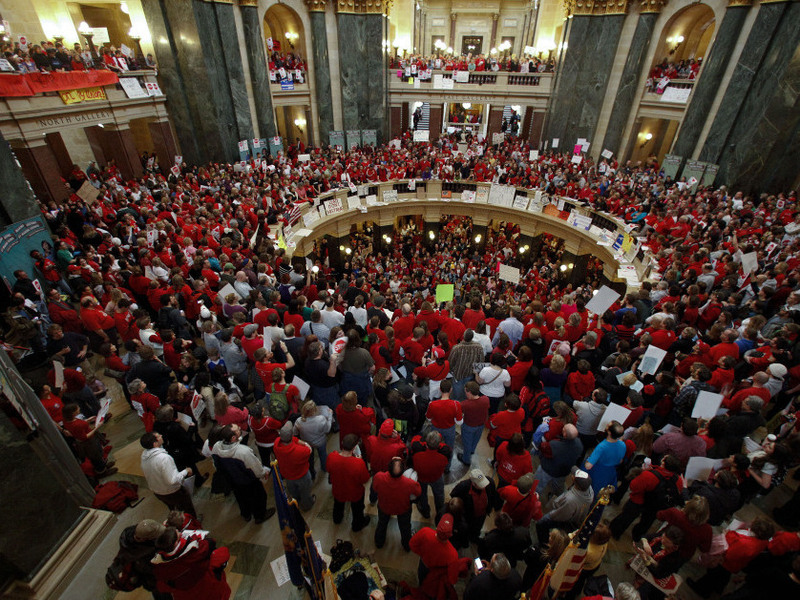 The reminders that elections have consequences keep coming, the latest example being from the state of Wisconsin where teachers and other union members are massively protesting in Madison, the state capital. CNN and other news media are starting to cover the demonstrations like the state capitol is Tahrir Square in Egypt. What's triggered the crisis is Gov. Scott Walker and the Republican-led legislature vowing to shrink a $3.6 billion budget deficit partly by forcing public employee unions, including teachers, to pay for more of their pension and health insurance costs. Walker and GOP lawmakers also seek to severely limit the collective bargaining rights of most public employees with a few exceptions in the public-safety area. In exchange, the governor is offering unions job security in the form of no layoffs. According to Wisconsin's legislative leaders, the Republicans have the numbers to pass the legislation. But evidently they don't have enough senators to reach a quorum because Democrats in the state's senate have evidently gone into hiding to throw a monkey wrench in the Republican plans. Good additional details about the standoff can be found in this Associated Press story. As you can imagine, in a state with a long progressive tradition that dates back to even before Sen. Robert "Fighting Bob" La Follette, this isn't going down too well. The unions, especially teachers, are up in arms. They are protesting in Madison, the state capital where they are chanting "kill the bill, kill the bill" in the state house. Many schools across the state are closed for the second day. "I haven't followed exactly what's happened with the Wisconsin budget. I've got some budget problems here I've had to focus on. I would say as a general proposition, everybody has to make some adjustments to the new fiscal realities. I think if we want to avoid layoffs, which I want to avoid, I don't want to see layoffs of hardworking federal workers. We had to impose a freeze on pay increases for federal workers in the next two years as part of my overall budget freeze. I think those kinds of adjustments are the right thing to do. On the other hand, some of what I've heard coming out of Wisconsin, where you're just making it harder for public employees to collective bargain generally, seems like more an assault on unions. And I think it's very important for us to understand that, public employees, they're our neighbors. They're our friends. These are folks who are teachers. They're firefighters and they're social workers. They're police officers. They make a lot of sacrifices and they make a big contribution. Scott and I are very close friends. We e-mail each other quite a bit... He's basically saying that state workers which have extremely generous benefits packages relative to their private sector counterparts, they contribute next to nothing to their pensions, very, very little in their health care packages. He's asking that they contribute about 12 percent for their health care premiums, which is about half of the private sector average, and about 5.6 percent to their pensions. It's not asking a lot. It's still about half of what private sector pensions do and health care packages do. So he's basically saying "I want you public workers half of what your private sector counterparts do" and he's getting riots. It's like Cairo has moved to Madison these days.